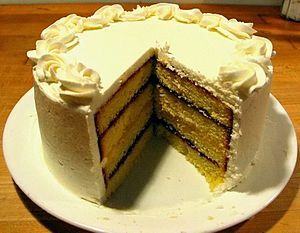 Image via Wikipedia -- A layered pound cake, with alternating interstitial spaces filled with raspberry jam and lemon curd, finished with buttercream frosting. This unit covers Part 1, Section 1 of Wrede’s The Messianic Secret. The text as we interpret it today. The text as the early church fathers understood it. What Jesus actually did, said, and thought. I’m jumping ahead a bit, but I think this is a crucial matter, and one that is sometimes ignored in current scholarship. Wrede cites Mark’s use of the term “Son of Man” as a probable indicator of messiahship. Many modern scholars would likely dismiss that characterization out of hand, because we know so much more now about bar nasha, thanks in part to works like Maurice Casey’s The Solution to the Son of Man Problem. Presuming Jesus did exist, he likely spoke in Aramaic. Hence, his pronouncements such as “The son of man is lord also of the Sabbath” probably meant “Man is master of the Sabbath” (i.e., the Sabbath was made for human beings and not vice versa). In fact this section is often seen as a Mark/Q overlap, with Matthew and Luke making the Son of Man the target of blasphemy while Mark makes the sons of men the perpetrators. But in any case it seems highly likely that Mark’s source said something like “All sins shall be forgiven ‘a man’ (bar nasha), but whoever blasphemes against the Holy Spirit will never be forgiven.” So Mark’s redactional handling of the logion shows us that he viewed bar nasha as a special title reserved only for Jesus. Something like this is the picture of the messianic life of Jesus which the prevailing critical view finds outlined in the Gospel of Mark, and which for this very reason forms the best point of departure for our investigations. I can hardly stress this point too greatly. When modern scholars and students conclude that Wrede’s contribution to scholarship was the discovery of Jesus’ concealment of his messianic dignity, they could not be further from the truth. What Wrede is saying is not, “Eureka! Mark’s Jesus kept his messiahship a secret.” Instead, he’s noting that the prevailing critical view was and is that Mark’s gospel contains a motif that we might call the “Messianic secret.” And that within this literary (or perhaps historical) motif, there is a consistent pattern of gradual revelation until everyone knows who Jesus is — even the centurion at the cross. Now John Wayne finally knows what only we, the readers, knew from the very start. Upon further examination . . .
Something odd happens when you start to look more closely at Mark. There seem to be conflicting threads, because for every call to silence, we read of an opposing account of Jesus’ fame being spread about far and wide. And while it would seem that Peter’s revelatory confession at Caesarea Philippi starts a new phase in the Gospel in which the disciples are onto the game and Jesus sets his face toward Jerusalem, it turns out that the Twelve are just as clueless after 8:29 as they were before. Does the idea of gradual revelation culminating in the Passion truly hold up under scrutiny? What we see, Wrede says, is not so much a progressive, incremental realization of Jesus’ identity, but sudden recognition followed by ignorance, followed by another sudden recognition. How does blind Bartimeaus know who Jesus is? Mark doesn’t say. And what of the entry into Jerusalem with the crowd crying “Hosanna”? It remains a mystery. The author closes this section on the general picture of Mark’s gospel with four observations that appear to indicate irreconcilable contradictions. 1. Jesus heals people and casts out demons “in the full glare of publicity,” and then commands silence. If Mark had a definite plan in mind, then we might expect the commands to silence after secret miracles to taper off, but they occur sporadically as late as 8:26. Did it not occur to Mark — if indeed his idea was “late disclosure of the Messiah” — that his narrative works against that goal? Mark certainly viewed the miracles as a sign of messiahship, so how can we account for the contradiction? 3. Jesus publicly calls himself the Son of Man very early (in chapter 2). Wrede concedes that he hasn’t proved that these statements are “incompatible with the writer’s presumed plan,” but the simplest reading of the text would tend to show that Mark thought of Son of Man as a special designation — since it plays a prominent role in Jesus’ predictions at the Transfiguration as well as the eschatological prophecy before the Sanhedrin. Our analysis of the gospel has raised too many questions to allow us to accept the popular critical view of Mark’s gospel. From all this I conclude that, just as much by what he does not say as by a series of definite statements, Mark shows he was unaware of the view of history ascribed to him. His presentation is altogether too confused to enable us immediately to gain a clear picture. Accordingly the view supported by prevailing criticism comes to grief. I draw only one provisional conclusion from the character of the Markan account which has been exhibited: that there is no more pressing need than to subject his data to thorough critical assessment. Posted on 2012-03-13 01:11:43 GMT+0000 by Tim Widowfield. This entry was posted in Biblical Studies and tagged Gospel of Mark, Messianic Secret, William Wrede, Wrede: The Messianic Secret. Bookmark the permalink. Peter realizes this earlier, in 8:27 ff. Cool undertaking! Are you going to continue? Yes, I do intend to post more on Wrede’s Messianic Secret.